Fans of Robert E. Howard frequently find themselves having to correct all manner of misapprehensions about him and his literary output. Two such misapprehensions concern Howard's portrayal of women characters and the mistaken belief that the man from Cross Plains had anything to do with the character of Red Sonja. 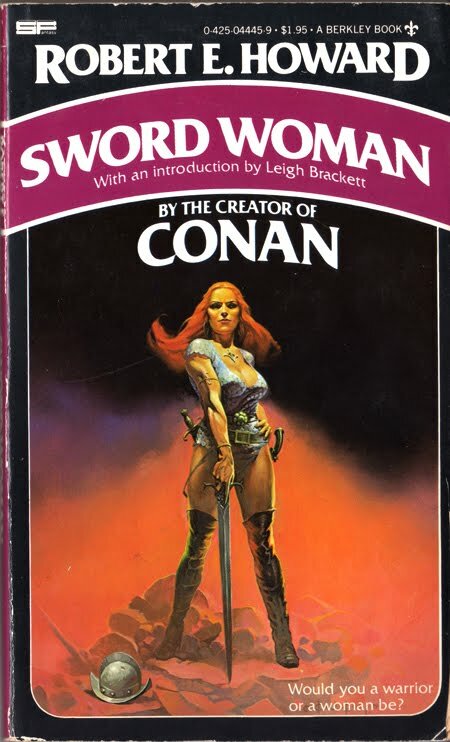 About the latter, very little needs to be said, as it's a fact of history that REH did not create the chainmail bikini-wearing Hyrkanian swordswoman, who made her first appearance in the pages of Marvel's Conan the Barbarian comic book in the early 70s. It's true that Howard did create a female character named Sonya of Rogatino for a single story called "The Shadow of the Vulture" (published in 1934), but this Red Sonya hails from the 16th century, not the Hyborian Age, and her prowess with pistol and blade stems from skill rather than a divine blessing. The question of Howard's portrayal of women characters is a complex one, but I think it's fair to say that, much like his male characters, his primary agenda was spinning a good yarn. Consequently, his females are what he felt they needed to be in order to tell the kind of story he wished to tell. Many were mere accessories to male protagonists, yes, but there are multiple examples to the contrary. 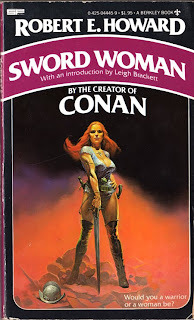 Indeed, I think Howard deserves far more praise than he often gets for his female characters, both in the Conan stories -- Bêlit and Valeria, for example -- and elsewhere. When he wished to do so, he could create female characters every bit as real and multifaceted as his male characters. Which brings me to Agnes de Chastillon, better known as Dark Agnes. Though created in the 1930s and the protagonist of three short stories (two complete and one not), she never appeared in print until 1975. Later in the same decade, these three two stories, the last of which was completed by Gerald Page based on Howard's synopsis, were collected together in the paperback volume depicted with this post. As depicted in her first story, "Sword Woman," Agnes is a Frenchwoman about to be married off to a man she does not love by her father, a former mercenary, who beats her when she shows signs of wishing to defy his plans. Unbowed, Agnes kills her husband-to-be on their wedding day and flees her father, hoping to make her own way in the world. She eventually makes the acquaintance of Etienne Villiers, who offers to help her find work so that she might not starve. Of course, the work Villiers has in mind is prostitution and Agnes soon makes him regret his intentions, nearly beating him to death in her anger. Agnes nevertheless forgives Villiers and meets another man, Guiscard de Clisson, who teaches her to use a sword so that she might better defend herself in the future. She takes to the blade with astounding speed and then attempts to join Guiscard's mercenary company as a soldier. What happens next sets the stage for the short stories that follow. Dark Agnes provides quite a counterpoint to Red Sonja, being an independent, capable swordswoman with a plausible backstory rather than being a mere vehicle for titillation. It's worth noting that Howard thought enough of Agnes that he sent his drafts to C.L. Moore, creator of Jirel of Joiry, to get her opinion. Moore was quite enthusiastic about Agnes, according to a letter she wrote to REH in January 1935. In addition, Howard goes to some lengths in "Sword Woman" to have male characters note that a female mercenary, while not the norm, was nevertheless not without precedent. As written, Agnes is remarkably believable -- not your typical "warrior woman," with all the pathologies that implies but rather simply a woman who wishes to be treated as an equal by men and women alike, a person who wishes to forge her own destiny. It's a pity that Agnes de Chastillon is not better known among aficionados of pulp fiction, as she's an interesting character who ably demonstrates Robert E. Howard's remarkable skill as a writer. Fortunately, her stories will be included in a new volume of the Del Rey REH library in 2011. Here's hoping Agnes, along with some of Howard's "lesser" characters, will soon become enjoy the readership they deserve. To me, the more complicated a woman the better. I collected Marvel Sonja for 30 years, but in any carnation she is the dream fantasy woman. Strong and wiley. Mmmm-mmm! When you take characters like Agnes, Valeria, Sonya, Tarala, Conchita and half a dozen more into account, Howard starts looking less like a chauvinist and more like the proto-feminist he is. The pulp cheesecake like Natala, Olivia and the like were, essentially, stuck in to titillate Margaret Brundage enough to get the cover illustration. Mags seemed to have a thing for depicting scenes of nubile lovelies whipping each other, so it was simple business sense. He took a great deal of pride in "Beyond the Black River" for the precise reason that he sold it without the prerequisite pulp cheesecake that normally sold. Besides, I choose to view REH - or any artist - on his best work. And his best female characters were nothing short of ahead of their time. Indeed, REH shieldmaidens Amy Kerr and Barbara Barrett are attending a PCA/ACA conference where they'll be presenting such a view. REH sistahs doin' it for themselves! Have REH's letters been published? I would like to know if this character was based on La Maupin. Bits and pieces of Howard's letters can be found in the Random House's recently published anthology of Howard's work. I link the first Conan collection, but there are several volumes so far. Just a couple of days ago, I attended a talk by Prof. Tony Goodman in which the character of the historical Black Agnes came up, along with a number of other strong-willed and war-like medieval women. I guess that REH found her as striking a figure as the professor did. I've been trying to track down Howard's boxer stories lately... does anyone know of a good collection? Yet the REH estate must own the Marvel Comics Red Sonja, because it's them who license the property to other companies, not Marvel. I've always been a bit confused by that. My understanding is that Red Sonja is owned by Red Sonja LLC, a separate company from Paradox (who own the rest of Howard), but that they're in an ongoing licensing agreement to license the elements of Howard's work that relate to Sonja. Pretty groovy, though like many I do maintain a soft spot in my heart for Sonja. Except unlike most I think I'd rather resemble her than screw her, but eh. Russell, this may be an obvious question, but why then do Marvel not own Red Sonja? I suppose that's the bit that confuses me. They created her, and although she has a similar name to a REH character, and appeared in a REH-licensed comic, she'd still be an original Marvel creation. Did they relinquish the rights at some point? I wish I knew. I suspect they sold the rights... and I wouldn't be surprised if the Sonya/Sonja rights were a pretty big mess at some point. Note that most of the Marvel Conan stuff has been sold or is being published by other publishers under license now. Hey, anybody remember Raven: Swordmistress of Chaos? Just speaking of Howard knockoffs. Thanks as always for the post, a great read. I just started rereading the Conan stories a few weeks ago. It’s been 30 years since I last looked at them. Fun quick reads that allow me to finish off a story before bed without staying up past midnight. I can’t say that about George R. R. Martin, who I enjoy for entirely different reasons. I would like to know if this character was based on La Maupin. True Howard scholars among my readers can correct me if I'm wrong, but I don't believe Dark Agnes (or the real Red Sonya) are based on any historical personages. Indeed, in "Sword Woman," characters make reference to another female mercenary, it's the fictional Black Margot of Avignon rather than someone from history. I guess that REH found her as striking a figure as the professor did. It's possible, although -- and, again, real REH scholars can jump in here -- I have never read anything that suggests Howard was basing his character on a historical personage. It's certainly not beyond the pale, however, and, for all I know, there may well be evidence to demonstrate a connection. There are a few collections kicking around, including one you can (I believe) still get through Amazon. There's also a four-volume set of them in the works from the Robert E. Howard Foundation. I don't know when that set will be released and it'll likely be pricey. Scallop: I'm unaware of any direct evidence that Howard knew La Maupin. In an epic smackdown to Harold Preece, where Preece stated that "the number of great women in history can be counted on one hand," Howard runs off a list of over two dozen great historical females: poets, philosophers, leaders, revolutionaries and others. Among those, only Joan of Arc is a warrior. Nonetheless, I don't doubt Howard would've been aware of leaders and warriors like Boudicca, Black Agnes, Grace O'Malley: it's possible he'd heard of La Maupin. I'm pretty sure he'd heard of Black Agnes, at least: Walter Scott wrote of her, and Howard devoured Walter Scott. While I don't think she was based on Black Agnes, she might well have been inspired. All of REH's letters have been published in three fine hardback editions by the Robert E. Howard Foundation. Ditto for his poetry. A several collections of REH's boxing yarns have been published. You can find info on them at TC or at the REH Forum. There's a thread on the REH Forum that discusses the Red Sonja situation (which is complicated). As Al said, there's nothing in REH's letters to show that he was aware of le Maupin, let alone based Agnes upon her. Al was probably too modest to note that he wrote an entry for TC about the "Black Margot" that Mal mentioned.